Whether its an old home in need of modernisation, a derelict building to redevelop or a change of home, always be sure to get a survey on the property to check for structural faults, signs of damp, dry rot and timber decay, to help you make the right decision and to avoid any hidden nightmares lurking under the brick work or floorboards. I have over 40 years expertise in the building industry. 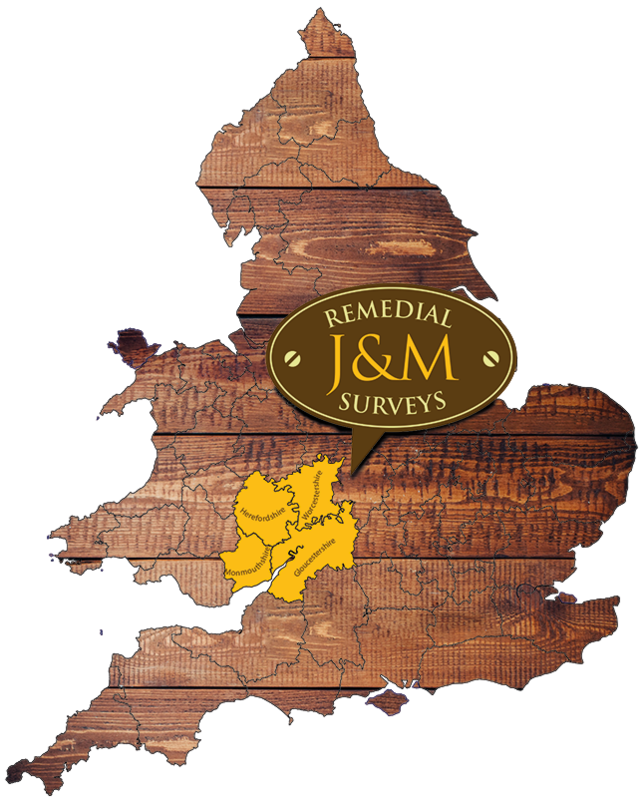 My company, J&M Remedial Services, has traded successfully since its inception as Forest Dampproofing back in 1981. I am a CSRT registered Surveyor and a member of the Property Care Association (PCA) as well as a specialist in Timber and Damp Pre-Purchase Surveys. Covering Gloucestershire, Herefordshire, Worcestershire and Monmouthshire,we can fully cost all work as well as introduce and/or manage contractors. This often shows as degrading or damp plaster towards the base of walls and is easily confused with rising damp. Basements below ground floors are particularly susceptible. Poor external maintenance of gutters, renders and decoration contribute to penetrating damp issues. Ventilation is so important, with increasing insulation and reduced airflow within a property it is critical to reduce condensation issues which can develop into unsightly and unhealthy moulds due to lack of efficient ventilation. Conversion of a basement can create valuable useable space. We can provide suitable specifications for Local Authority approval dependent on required bespoke internal design and layout.As a Property Care Association (PCA) member company, we only work to BS8102 (2013) for structural waterproofing of all types. 10 year insured guarantees can be available. We can survey for wall tie issues and retrofit new stainless steel mechanical or chemical fix wall ties. 10 year insured guarantees can be offered. We offer a full service for all types of timber infestation and decay issues, and have been carrying out repairs and treatments for over 25 years. 45 years` experience and understanding building construction and design gives us a unique advantage to recommend the most successful treatments, in particular identifying the extent and appropriate treatment for dry rot issues. The key here is our ability to correctly identify the cause by understanding ventilation and building construction, so we can recommend the most effective treatment. This is an increasing issue in our properties today. By recognizing the cause ie. Lack of breathable finishes to walls. Over-use of non-breathable paints, papers and sealers. Poor ventilation. Thermal issues we can recommend the best way to treat the problem and prevent future issues. This is often identified as damp spots and patches on walls seemingly unconnected to any damp source. Interstitial condensation is closely connected with salt contamination and related issues. Lack of maintenance and misunderstanding of the importance of airflow through properties can result in extremely expensive and long term repairs. Whole house BPEC ventilation surveys identify the issues at a nominal cost and allows for corrective upgrading of equipment and/or insulation required, to reduce long term maintenance costs. Join over 3,800 businesses and general public from Gloucestershire, Herefordshire, Worcestershire and Monmouthshire, who have benefitted from our work.